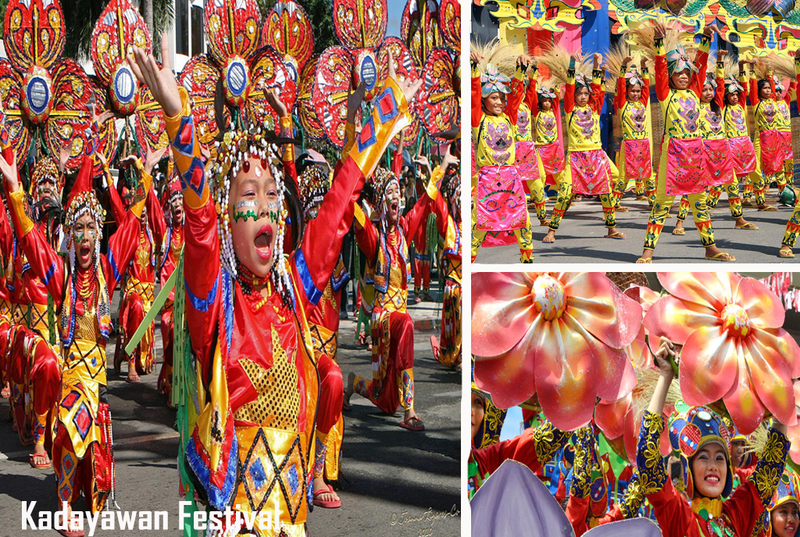 A celebration of good harvest, Kadayawan is a weeklong feast celebration in the City of Davao being celebrated every 3rd week of August as a thanksgiving for nature’s bountiful harvest, the wealth of culture, and serenity of living. From the word “madayaw”, a friendly greeting also used to mean good, profitable, superior, beautiful and valuable. It was said that long time ago, tribes of Davao gathered together to offer their rituals of thanks giving at the foot of Mt. Apo. Thanksgiving was particularly for “Manama” (the Supreme Being). Farm produce like flower, fruits, vegetables were displayed. This practice of Thanksgiving and “pahinungod” (dedication) transformed in modern days, it was developed into an annual festival of thanksgiving. In 1970, Mayor Elias B. Lopez begun to include the tribal dance and rituals of Lumad (indigenous people) and the Muslim tribes of Davao. Later in 1986 the festival was called “Apo Duwaling” representing Mt. Apo which is the country’s highest peak, Durian, the king of fruits; and Waling –waling the queen orchids of the Philippines. “Apo Duwaling” was meant to show that Davao City is a peaceful city to visit and to do business after 1986 EDSA revolution, and to gather the people to forget the chaos in time of Martial Law. And finally in 1988, the festival was renamed by City mayor Rodrigo Duterte as “Kadayawan sa Davao” to celebrate the ample harvest of flowers, fruits, and other produce, and to showcase the wealthy culture of the City. The Festival is jam-packed with different activities. Floats of flowers and fruits are very eye catching at the parade. The streets are adorned with local fruits and vegetables. People hold dances for four days. Native and power boats also race at the harbor. Stallion fight to determine who will mate with a mare. Indak- indak sa Kadalanan, a street dancing competition, where dancers are wearing colorful costumes; the participants are gracefully dancing like there’s no time to rest. And if you are looking for a local recipe and gourmet food that taste with the touch of Davao’s ways of cooking, Hudyakaan sa Kadayawan is the best. A 3 week- long food and beverage market that offers local cuisine to tourists and guest every night. Lumadnong Gama, for what they call is showing artifacts, wares, products and cuisines of indigenous people while going to Dayaw Market, is the best to try if you want homegrown and organic produce. For the meantime, be amazed for Lumadnong Bantawan, a tribal performance of the city’s ten tribes in different location that is filled with music and dancing wearing their costumes and jewelries. And if you want to divert yourself from heavy rock music, Tunog Mindanaw, is a nice alternative, it is a competition of different Mindanaoan musicians and composers. Pahalipay Concert, as what they call it, features various local and national artist to entertain and give delight to a program, and no one can resist the Pamulak sa Kadayawan, where parade of floral floats richly decked with colorful tapestries and exotic flowers are showcases. Literally meaning street food, Kaan sa D’an is a different sample of wide array of street foods that is indigenous to Davao and in Philippines. And of course you don’t want to miss this beautiful event, grab your camera and give your best shot to give an entry to Hulagway, a photo competition that is part of the festival. To complete the festivity the Bya’Neng ng Kadayawan or the Miss Kadayawan is much awaited night for choosing the most beautiful women to represent Davao City. If you are attending the Kadayawan Festival, you must bring umbrella to help you to survive the heat, some cash, camera and numerous smiles to return to those hospitable locals. Be open minded person because you may not hear those music in billboard’s latest chart. Davao’s location is best for adventure and nature travelers, it is located between Davao Gulf and Mt. Apo. It is a hilly place that is best for adventurous biking hobby, and the sea is good for divers who want to look at the diving spots scattered around Samal and Tallicud Islands. And looking for whitewater rafting hotspot, Davao River is just nearby. Davao is also known as the “Durian Capital” of the Philippines, producer of sweet mangosteen, lanzones and marang. It is the fourth-most-populous city in the Philippines, and the most populous in Mindanao; but it is constantly described as one of the safest cities in the Philippines.